For the vast majority of the public, cloud computing remains a mystery. It is enough to recall a few recent – and funny – movie lines, where storing a video in the cloud is assumed to mean it will be lost forever in some far-off galaxy and that its destiny is therefore entirely out of our control. This concern over data control is a central issue of cloud computing. But what is the difference between the cloud and a data center? A data center is a physical technical facility housing the servers of one or more businesses or organizations, with its own means of ensuring reliable and secure operations (electricity, air conditioning, and broadband access). The cloud, meanwhile, offers users access to virtualized computing resources over the Internet through standard mechanisms (as specified in the National Institute of Standards and Technology definition), which a data center does not. These digital services can vary, ranging from equipment or infrastructure services (storage space, computing power, etc.) to platform services (development environments, databases and application servers) to software services (software applications for businesses and individuals). A cloud system may draw on multiple data centers. These services are deployed either over shared, pooled environments for the general public (public cloud), over environments specific to a limited consumer group (private cloud), or over a well-defined community (community cloud). Since it was introduced to the consumer market, the cloud has been the hottest topic in technology. Governments, under the pretext of sovereignty issues, are keen to follow the United States or the United Kingdom in starting their own cloud; companies look to optimize their IT expenses by outsourcing part of their data storage management; communities want to pool their resources, etc. In higher education and research, data center projects abound but the financial context is increasingly restrictive. With mounting pressure from the government to pool resources – IT resources included – the time seems ripe to provide an update on the cloud situation that will clarify not only the financial issues, but also the security and organizational issues involved in implementing a cloud in the higher education sector. How can we define the cloud today? How can we best address security-related issues? 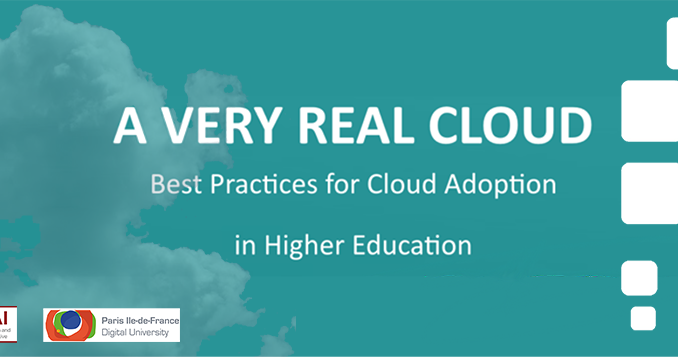 In what way is mainstream use of the cloud transforming universities? How can universities adapt to the changes that new technologies bring? In what ways has the cloud generated a new financial model? How does it alter the map of technology use in different regions? 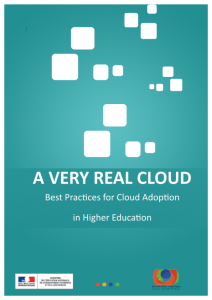 This paper, published by the kind permission by the French Ministry of Education, aims to answer these questions in order to build, if not a new, then at least an up-to-date vision of the possibilities the cloud offers for higher education and research. The report, focused on the French Higher Education sector is accompanied by case studies and interviews from all over Europe.